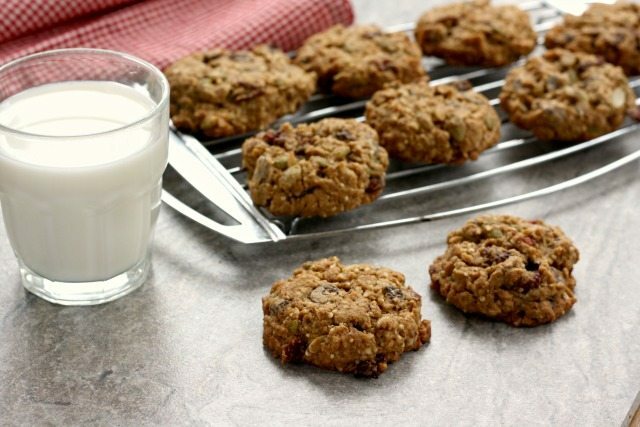 Low sugar oatmeal chocolate chip cookies are a wholesome and hearty lunchbox treat. They’re filling, relatively low calorie and low in sugar, a good source of fibre and full of healthy stuff. March is school break month and while many families fly off to warm destinations for the week-long holiday, it’s still one of the best times for an old fashioned family road trip. I grew up heading off to Sugarloaf Mountain in Maine for my March break. We’d pile in the car that was stuffed to the rafters with ski equipment and winter gear and drive six hours to the hill, singing all the way. In fact, when I was growing up every road trip involved singing songs we all learned at Camp Genburn. Singing helped pass the time and kept us all distracted enough that we didn’t squabble during the long drive. The in-car picnic lunch also helped to pass the time. (It also helped save time and money since we only had to stop for bathroom breaks between home and the hill.) In my experience, good food is one of the essentials of a successful (and memorable) road trip with a car full of kids. A healthy lunch and wholesome snacks go a long way in preventing meltdowns, in both kids and adults. Lots of cookies and snacks are high in sugar or aren’t aren’t filling so they don’t hit the spot. 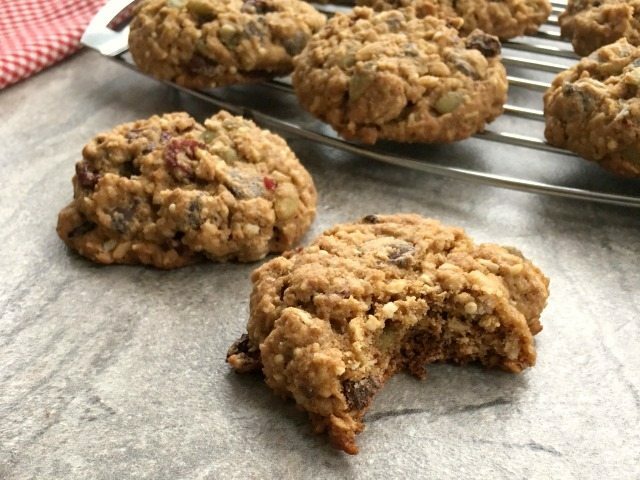 Pairing these low sugar oatmeal chocolate chip cookies with a piece of fruit makes a great snack combo that will tide you over until mealtime. If you’re planning a March Break road trip, these low sugar oatmeal chocolate chip cookies are a wholesome and hearty lunchbox treat. They have just enough chocolate chips to keep everyone in the back seat content. They’re lower in sugar and fat than most cookies, are a good source of fibre and are filled with healthy stuff. In a large bowl cream butter and sugar until light textured. Add egg then molasses and vanilla. Sprinkle over the flour, flax, millet (or sunflower seeds), baking soda, baking powder and salt. Stir to combine. 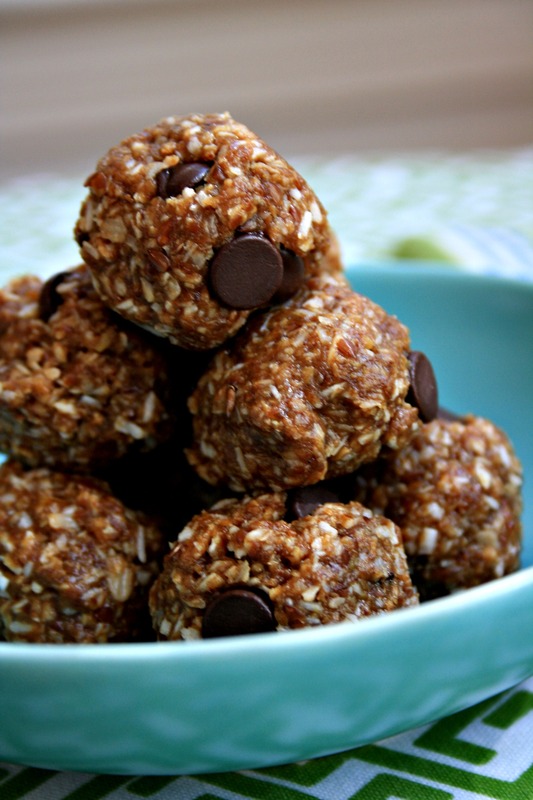 Stir in rolled oats then chocolate chips, dried cranberries, coconut and pumpkin seeds. Sounds great for an after school snack. Always look forward to your healthy recipes. Thanks Mary, This is one of my favourite recipes.